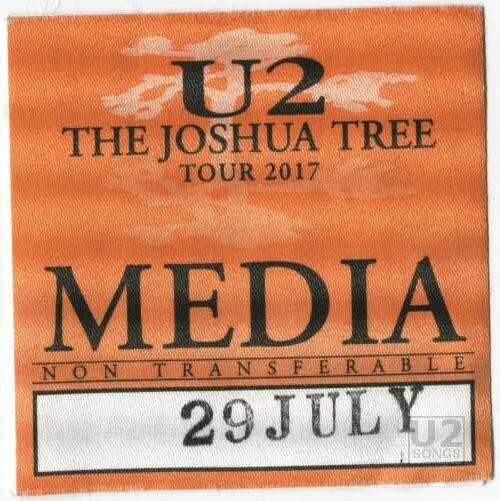 Hard to believe one year ago today we were still waiting for news where the new tour, The Joshua Tree 2017 would visit. Before The Joshua Tree 2017 fades into everyone’s memories, we thought we would take one final look back to look at some of the merchandise that many may not have seen along the way. Some of the odd bits and pieces related to the tour, but not available at every merchandise stand or every venue. T-shirts, patches, plastic drinking cups. Some of the oddball stuff not necessarily found at the merchandise booths. UPS was the official Logistics provider of the tour, and these small wooden tokens with the tour logo were given out at a number of stops during the tour including stops in North America and Europe. But only limited numbers seemed to be available each night. The token is wooden, and has a design burned in, with the Joshua Tree 2017 tour logo on one side, and the other side the logo for the UPS Fan Experience. The tokens are four centimeters in diameter. In each case we know of, the tokens were given away and not sold, usually for completing some activity. In Louisville, KY they were given out at the UPS booth to fans who entered a promotional contest that night. In Belgium, 100 of these tokens were given out to the first 100 people to arrive by bicycle and use the bicycle park at Avenue Houba-de Strooper. We are told in another location they were given out when fans used a reusable water station to refill a bottle. The final leg of the tour visited Mexico and South America. During that leg they played Mexico City in Mexico, Bogota in Colombia, La Plata in Argentina, Santiago in Chile and Sao Paulo in Brazil. 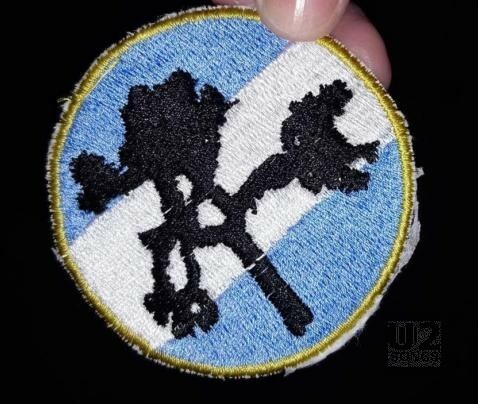 At least four of those countries got at least one additional item at the merchandise stands, a round patch featuring the silhouette of the Joshua tree used on the album cover, with a background that reflected the colours of the flag of the country. We know that Mexico, Colombia, Argentina and Brazil all had these patches, as can be seen from the photographs. Please get in touch with us if you have information about Chile, and whether or not there were patches for this country as well. The patches are embroidered and quite nice. Many thanks to Agu2arts for the photograph of the Argentinian patch. Like the 2015 tour, there was a book given out this year with VIP tickets purchased on The Joshua Tree 2017 tour. The book included a replica tour harmonica, a metal coin and a bunch of replicas of old posters, and ticket stubs. Many aren’t aware that there are two different print runs of this book, and three total variations of the book. The first one was printed for the initial tour, and numbered 25,000 copies. Each of these copies are hand numbered. These were used throughout the first and second leg of the tour, as well as for early dates on the third leg of the tour. The original print run was done before the tour was expanded to a third leg, and later a fourth leg, and although 25,000 copies would have been sufficient if the tour had stopped at two legs, it wasn’t with these added shows. Additional copies were needed to finish out the tour. A second print run saw an additional 7,500 copies of the book produced, and again these are individually numbered but out of 7,500 in the back cover. A third variation does exist. As the tour moved into Mexico and South America, the booklet included was printed in Spanish as well and included in the book. These books with the Spanish booklets were part of the 7,500 print run. 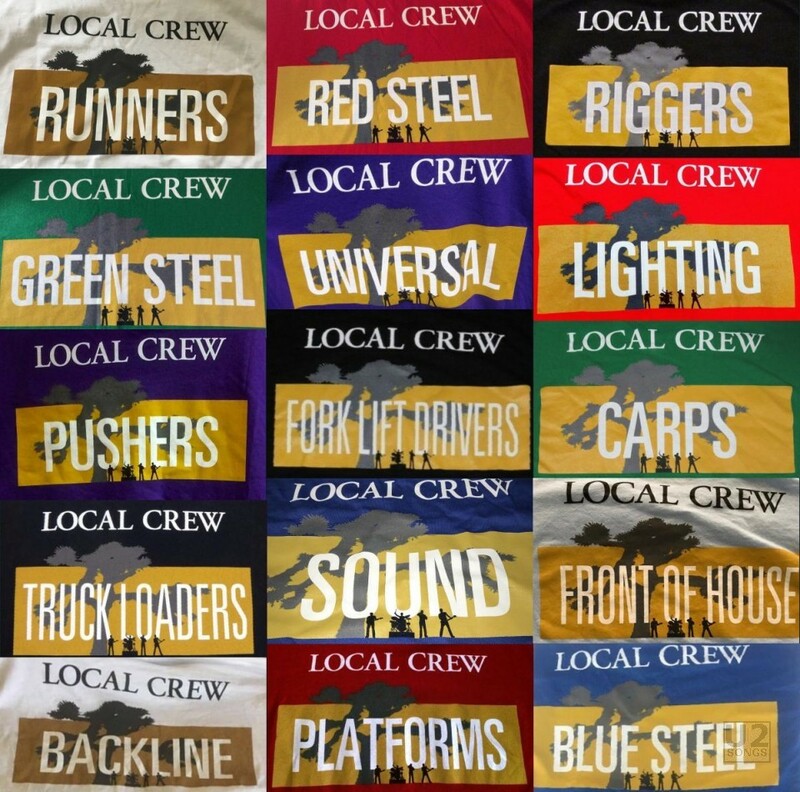 Most of these crew T-shirts appear to have been produced in size XL. When the tour started, every venue had wristbands for those on the floor of the venue. These either had chevrons or stripes and were one of seven different colours, making for fourteen wristbands in total. The seven colours were yellow, green, orange, purple, pink, brown and two shades of blue, a light and a dark blue. At some locations the print was considerably darker and closer to a burgundy colour. Each had a golden embossed Joshua Tree 2017 tour logo on the band. Each night the tour would switch back, using squares one night, and the chevrons the next, and a rotating colour scheme was used throughout the tour. 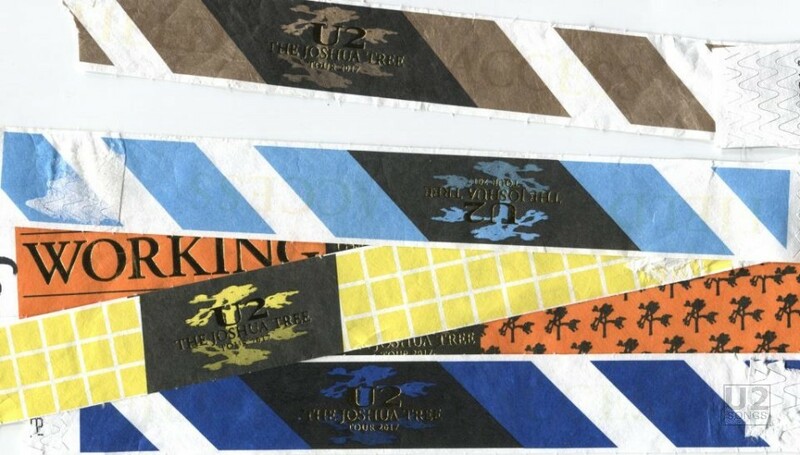 As the tour moved to Europe, these wristbands were used for some shows but not all, and many floors had no wristbands at all, or were just limited to the first 300 – 500 people who lined up. There were also a variety of other wristbands used on the tour, including those for the (RED) Zone, and working wristbands, one of which can be seen in the image above. The (RED) wristbands in use were fabric in most locations with a plastic slider to lock them in place. Stick on patches were also used throughout the tour for access to some locations. Below is an image of one of the passes used for the photography pit during the Amsterdam show. These too changed colours as the tour progressed, and were also stamped with the date of the show they were to be used for. Each is fabric, on a sticky background allowing the patch to adhere to clothing. Sometimes at a tour stop you will get lucky, and The Edge will throw out a pick. Other times the techs who set up the equipment and pack it away will throw some picks from the stage. Often these are generic, but sometimes they are printed with tour designs. On The Joshua Tree 2017 tour, one design is pictured above. 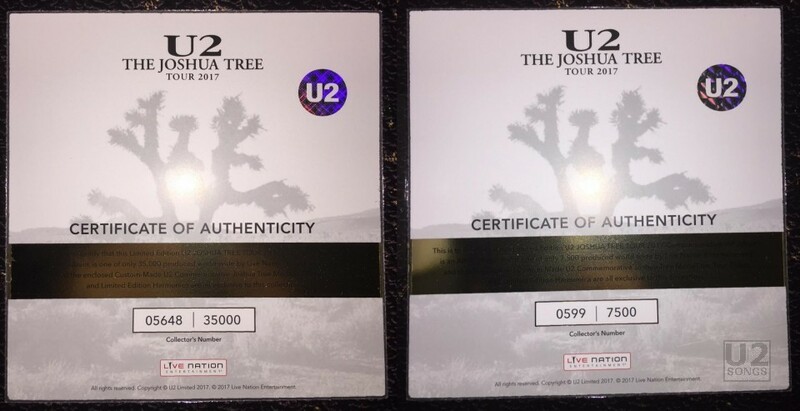 The dark grey pick is printed on both sides with gold foil, showing a Joshua Tree on one side and “U2 JTT 2017” on the other. An alternate version of the pick had the same images on either side of the pick, but they are printed in black on a clear pick, thus you see one image through the pick as you look at the other side. 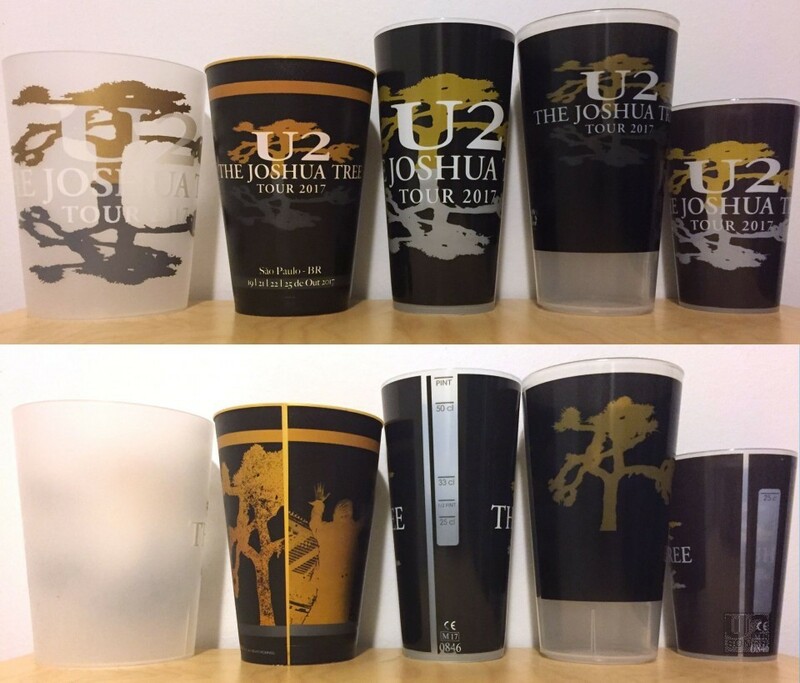 Starting with the second leg of The Joshua Tree Tour, many venues offered plastic cups with the logo of the tour for a small deposit. You could keep these as a souvenir, or you could at some venues return them for a reduced price on your next beer in the cup. Some venues allowed you to purchase the cups separate, others required that you buy a drink. The idea behind the cups was to reduce waste at the venue, by offering a collectible that people would take home with them. There were five different designs that we know of sold throughout the tour. The one on the far left was sold in Barcelona only, and is a clear large cup, with the tour logo in shiny gold, grey and white ink. The one second in on the left was produced for shows in Sao Paulo, Brazil. This cup had a gold band around the top, and the cup is a gold plastic. These list the city name below the tour logo on the front. On the back is another silhouette of The Joshua Tree, as well as an image of Bono taken from behind. The third cup pictured (in the middle), in black, was actually the first one we saw being sold. It appeared in London at the first show on the second leg of the tour, and was sold throughout a number of concerts in Europe on the second leg of the tour including Barcelona and Paris. On the back of this particular glass there are measurement marks so bartenders know what level to fill a drink. The fourth cup, black with a clear base, was sold throughout the third leg of the tour in the United States, at most shows, and also sold at several shows on the fourth leg, including both concerts in Mexico. Finally the fifth and smallest plastic cup, in black, was sold in Barcelona, one of three different designs present in Barcelona. This is the smallest cup of the five, and was only present at the Barcelona shows. On the first leg of the tour, in most cities, a T-shirt that was city specific was designed and available on the merchandise stands. These shirts were in grey and gold ink on black fabric, and featured a large silhouette of the tree in grey with the venue location printed over the tree in gold. Above the tree was a “U2” in an oval. These shirts were discontinued after the first leg, and were not seen in Europe or later legs of the tour. However there were a couple of unique T-shirts we’d like to spotlight. The first was produced for the final four shows in Sao Paulo, Brazil, and is blue with a yellow tree silhouette, with the city name, the dates, and the year on either side of the trunk of the tree, and the stadium name printed on the trunk. These were sold at the final four shows. Like the plastic cup, and the patch, these items were produced specific for the concerts in Brazil. The other shirt of interest, was a red t-shirt produced for shows in New Jersey towards the end of the first leg of the tour. The T-shirt was red, with U2 in black, similar to what you see during the tour when “Where the Streets Have No Name” would start, and the band is silhouetted against the red screen. In the image Bono’s hand is raised, and in the black of the stage below the band is listed “The Joshua Tree” in red, and there is a white “U2” above the band’s heads. The shirt is not marked as venue specific, and don’t list the dates of the shows, however, it was only at the shows at the end of the first leg of the tour where these were available. The shirts were not seen in Europe on the second leg of the tour. With a tour the size of The Joshua Tree, there are bound to be many other items as well that people will prize and enjoy that don’t necessarily come from the tour merchandise stands. This includes ticket stubs, collector cards used for entrance, tour signage, and other printed materials. We can’t show you everything along the way, but it’s nice to be able to have a look at some of these materials before the tour passes into memories.